I often get asked for information on celiac disease and gluten-free. Either it's someone that is just starting to investigate gluten as the source of their health issues, or it's someone that is just newly diagnosed and looking how/where to start. So, I gathered up a bunch of resources and created this document. 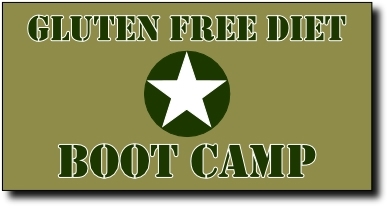 The original Gluten-Free Diet Boot Camp was created in 2005. What you see here is an updated version of it. I am throwing A LOT stuff out here, please don't let it overwhelm you. If your head starts spinning, stop reading for awhile. While it may be very confusing to you right now, please know that it does get easier - it really does. "Celiac Disease Screening Round Up"
Note: If you have not completed testing for celiac disease, please do so before going further. Why? One must be consuming gluten for the tests to be accurate. You’ve been told you must go gluten-free and think, “What am I going eat?”. The more you think about it, you realize how monumental this is going to be. When faced with a large task I like to break it down into smaller, more manageable chunks. Focusing on smaller tasks makes this process much less overwhelming. Don't pressure yourself into trying to learn everything in one day. The most important tool you can have when dealing with this is KNOWLEDGE. Knowledge means health. The more you know (about yourself, about your food, about this condition), the better you will feel. Step 1 - Stay Calm. Try not to panic, this is not the end of the world. While it will take some time for you to settle into the GF lifestyle, it is very do-able. With a bit knowledge and a bit of planning, you will be successful. You are not alone, people all over the world live this way. Currently, it is now easier to maintain a gluten-free lifestyle than any other time in history. For better or worse, gluten-free has made it to mainstream awareness. While there is room for improvement, things are going in the right direction. Gluten-free options are plentiful, but, they are not always healthy. Gone are the days of 20 years ago when it was the rice and banana diet. Fear not...you will not starve! There are many foods that are naturally gluten-free - and darn tasty! "Grieving the Loss of Gluten"
Be aware, that you may go through a grieving process. Leaving your old lifestyle behind will be an emotional experience - a roller coaster ride for sure. This is common, normal and healthy. Do not suppress these emotions - recognize them and deal with them. Step 2: Identify & remove the obvious foods from your diet. This is usually quite "easy" to do. I don't mean emotionally or physically easy to do, but easy to identify. Gluten is generic term for the proteins found in wheat (durum, graham, kamut, semolina, spelt), barley, rye & triticale (hybrid of wheat & rye). Any product made with or contaminated by these ingredients is off-limits - breads, crackers, cereals, pasta, pizza, cakes, pies, cookies, many soups, etc. Don't forget beer. The best (and simplest) recommendation I can give you when going gluten-free (GF)...stick to single-ingredient,"whole" foods. Whole foods are foods that have little or minimal processing done to them. Anytime a food is processed, there's a good chance gluten is added to it either by design or by accident [cross contact]. 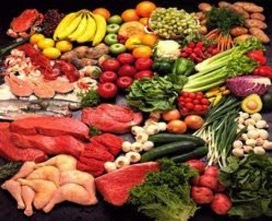 Think fresh fruits and veggies, plain meats, poultry, seafood, eggs. Avoid products with marinades, sauces or seasonings-they may contain gluten. Finding gluten in a head of lettuce or a bunch of carrots is pretty hard to do. After you start to feel better you can branch out a bit more in to the processed food if you wish, however I know many people stick to the whole foods. Tip: shop the outside perimeter of the store. Usually this is where you find the produce, eggs, plain meats, etc. Tip: Stick to foods with short ingredient lists - the shorter the better. It's better for you and requires much less reading. The best - single ingredient foods. Step 3: Look for hidden gluten. This may take you some time for figure out. You WILL become a label reader. In order to stay healthy you will need to check every ingredient in every product you come in contact with - both ingested and topical. Be prepared to spend a couple of hours getting groceries. It will take that long due to label reading. After you read a few labels, you'll know why I suggested focusing on whole, single ingredient foods. Processed foods are a minefield when it comes to reading labels to determine if there's gluten. Not much to read on a head of broccoli, a bag of carrots, a head of lettuce, etc. If you do buy processed/packaged foods check the ingredient label. If you see any of these words: Barley, Malt, Malt Flavoring, Malt Vinegar, Rye, Triticale, Wheat (Durum, Graham, Kamut, Semolina, Spelt), Brewer's Yeast - put the product down. If you can't tell from the ingredient list, call the manufacturer and ask them. Also look for a gluten-free certification. This seal tells you the manufacturer has specific standards, policies & procedures for making gluten-free foods. If you are unsure about a product, don’t eat it. Avoid commercial or mainstream oats [think Quaker Oats] or products that use them because they can have high levels of gluten due to cross-contact. Pure, uncontaminated gluten-free oats can be tolerated by many, but for right now - this minute, no oats. Those new to gluten-free should abstain from oats for at least one year. Oats have been controversial for decades, please look at all the information before you decided to add oats to your diet. Please see our Oats section below for more information. Other areas to look for gluten - medications, vitamins/nutritional supplements, cosmetics, soaps, shampoos, toothpastes, etc. If a gluten-free food has cross contact with gluten, it’s off-limits. It only takes a crumb for many to get sick. Crumbs matter? Yes crumbs matter! It only takes a small amount of gluten to put your body into an inflammatory state. Have you double dipped in the peanut butter, Mayo jar, jam/jelly jar, butter dish, etc.? It's contaminated. The best thing to do is go on a cleaning spree. Remove everything from your cupboards. Toss the gluten filled/contaminated junk and meticulously clean everywhere with hot soapy water - changing it often. Even move the stove and fridge! A gluten-free diet is not like a diabetic diet where you can balance it out. There is no room for cheating. Everyone one will have different sensitivities to the gluten they might ingest. Some may be dreadfully sick for days/weeks from the smallest crumb. Others, may only have reflux, gas, bloating. Some won't have any reaction at all! Even though you may not be able to feel the effects of gluten, your body's immune system is in overdrive. Not adhering to the diet leads to nasty outcomes...the possibility of cancer and a cascade-effect of other auto-immune diseases. Step 4: Join a local support group. As good as online sites are, there is nothing that can replace face-to-face, human interaction. According to a Columbia University study, celiac patients reported better quality of life when they participated in face-to-face support groups compared to online support groups. Also, longer duration of face-to-face support generated a greater quality of life. The gluten-free lifestyle requires hard work, dedication, commitment, and knowledge. The emotional and physical stress of a difficult lifestyle change piled on top of years [often decades] of ill-health, takes its toll. Every opportunity for a positive outcome needs to utilized. Making the transition not easy for you, nor is it easy for your loved ones. Often times spouses, family & friends may not always understand exactly what you are going thru. They may not understand how vigilant you must be at keeping gluten out of your diet. In fact, unsupportive friends and family can be a huge detriment to your success; surrounding yourself positivity gives you the best environment to flourish. Connecting with others that share your same situation can give you a huge boost emotionally and physically. Many others experience the same trials and tribulations you do. A collection of articles that I've written. Confusing Ingredients - GF or Not GF? Educating Family & Friends About Gluten-Free - A collection of resources I assembled over the years to educate others. Includes a Powerpoint presentation I did for our church. Better Living Thru GF Chemistry - A primer on medications. Gluten-Free Cosmetics and Hair Care Products - Gluten on the Skin? Gluten: Worth the Risk?, Gluten-Related Disorder: Sick? Tired? Grumpy?, Gluten: ZERO Global, Gluten Brains: the brain-grain connection, The Gluten Syndrome: is wheat causing your harm? GF Recipes can be found simply by searching the internet. There are so many bloggers and websites that offer GF recipes, it's amazing. A lot can be found on Facebook. You'll notice that many of our recipes are pretty simple. I really like taking simple ingredients and making amazing meals. It's truly a case of "The whole is greater than the sum of it's parts". We do a fair amount of entertaining and hosting of family events [because we both like to cook and because it's easier for us to control the food]. Our goal is to show that gluten-free food is not taste-free, crappy food. We are successful at it if I do say so myself. Published lists of gluten-free products (electronic or paper), are easily outdated. Please keep in mind, you still need to read labels and sometimes verify GF status with manufacturers as ingredient lists can change - generally without notice. Use these lists/apps, as a guide, not as the sole means of determining the GF status of a food. The safety of oats for those on a gluten-free diet is a topic that has been debated for decades...and it still continues today. Please research this topic carefully before making your decision about oats. What oats are used in gluten-free products? This article examines the difference between Purity Protocol Oats vs Mechanically/Optically Sorted oats…and why it matters. I can't eat gluten. Can I safely include oats in my gluten-free diet? "The safety of oats in individuals with celiac disease has been extensively investigated. Health Canada has reviewed the clinical evidence from numerous international studies and has concluded that the consumption of oats, uncontaminated with gluten from wheat, rye or barley, is safe for the vast majority of patients with celiac disease. A 2015 review entitled Celiac Disease and Gluten-Free Claims on Uncontaminated Oats is available on Health Canada’s web page Celiac Disease and Gluten-Free Claims on Uncontaminated Oats"
A special caution must also be delivered when it comes to oats. While oats in their natural form do not contain gluten, a small portion of patients with celiac disease react to oats in their pure, uncontaminated form. Some literature suggests that a protein in oats can trigger a similar response to gluten. Additionally, most mills that process oats also manufacture gluten-containing grains, making the chances of cross-contact inevitable. The best advice we can offer is to take a great deal of care before introducing oats into your diet, which includes speaking with your healthcare provider about this dietary change. There is no way to determine if you will react, so proceed with caution. Verify that the oats you are using are “pure, uncontaminated,” “gluten-free,” or “certified gluten-free.” Experts recommend that up to 50g of dry gluten-free oats are considered safe. Check nutrition labels for portion size. A large body of scientific evidence accumulated over more than 15 years has proven that oats are completely safe for the vast majority of celiac patients. Oats are not related to gluten-containing grains such as wheat, barley and rye. They don’t contain gluten, but rather proteins called avenins that are non-toxic and tolerated by most celiacs (perhaps less than 1% of celiac patients show a reaction to a large amount of oats in their diets). Oats can be in a celiac’s diet provided they are selected from sources that guarantee a lack of cross-contact of wheat, rye or barley. Some who add oats to their diet may experience GI symptoms. This may actually be a result of the increased fiber that oats provide instead of a reaction to the oats themselves. Remember: Use published lists wisely. Always read the product ingredient list. If you're unsure, call the manufacturer [even from the store] and ask. GF status checks are generally the #1 type calls customer service reps get. Also be conscious of the amount of processed foods you consume. Try to use them sparing or even better, not at all. Many in the GF community feel their best when all processed foods have been removed. Keep in mind, fine tuning your diet is a work in progress; you keep tweaking it so you can be at your best. Making the leap to gluten-free can be a daunting task, GF processed foods could be used as a stepping stone to help make that transition a bit easier. Everyone handles change differently. You need to figure out what works for you, what gives you best chance a success. Tip: "When in doubt - leave it out". If you can't verify the status, put it back. Tip: When checking the ingredient labels, use the 3-times rule. Read the label when you purchase a product, when you put it away in your pantry and again when you retrieve it to use. This will help minimize mistakes. Note: Festival Foods Deli is not a dedicated gluten-free environment. However, their staff has participated in the National Foundation for Celiac Awareness GREAT Kitchens Program. A training program to educate food service professionals on gluten-free food preparation and cross contact. Dining out is also a minefield. All too often, restaurants don't understand the intricacies of properly preparing gluten-free food. The risk factor for gluten cross contact is generally quite high. However, with proper training food service professionals can successfully create delicious gluten-free food. In many cases, the restaurants that do the best job have a family member that must be gluten-free. They understand the workings of a busy kitchen and educate their staff how to keep their guests [and family members] safe. There are many in the gluten-free community that do not eat out at all. They simply won't risk their health for a meal out. This is a personal choice that we all have to make. Tip: If you are new to gluten-free, refrain from eating out until have a good handle on the gluten-free diet at home. This minimizes the risk of further gluten exposure and gives your body time to recover. Added GIG of ECW Articles list. Add additional GIG of ECW articles and update dead links. Add GIG of ECW Newsletter link. Add GIG's Easy-to-Find and Easy-to-Fix food ideas. Fixed: Broken GIG general information links, General Mills GF Product Guide Link, Annalise Roberts recipe links, Campbell's link, Festival Foods Packaged Foods list, Schar Pasta Link, GIG Restaurant Cards link.